This beautiful black platter was made by my uncle, master potter David Walters. I'm not usually tempted by food gimmickry, but this suggestion put a sparkle in my heart and sent me racing to the kitchen. Well, to be accurate, it sent me racing to the supermarket, where I found red, yellow and green peppers (in season now) heaped in glorious shining piles. I met the man who was to become my husband when I was fifteen, the year before I matriculated in 1979, and Bob Marley's music is so deeply entwined in our friendship (and subsequent courtship) that I could write several chapters on the subject. I won't bore you; suffice to say that 'Redemption Song' is very dear to my heart, and still raises the hairs on my arms whenever I hear it. As it does, I guess, to many people of our generation. And, besides, 'redemption' is, in my opinion, one of the most beautiful words in the English language. It rolls like warm butter from my lips, and is so suffused with goodness, mercy and sunshine that just saying it fills me with the warmest ole feelings. I hope this recipe will fill your tummy with warm feelings. I've refined it somewhat by dressing each 'stripe' of pepper with its own flavoured vinaigrette. If you don't have time to footle about, omit the flavourings that are stuffed into the peppers before they're baked, and use the basic vinaigrette to dress all three stripes. This salad needs to be made and dressed a few hours in advance, so that the flavours have a chance to mingle. This is quite a large quantity, suitable for feeding a crowd, but the recipe is easily halved. Serve the salad with plenty of fresh crusty bread (or slices of toasted ciabatta bread). It's good on its own, but even better with a selection of cool Mediterranean toppings: ricotta, feta, mozzarella or goats' milk cheese, brined capers, bottled anchovies, salty little olives, basil pesto, and so on. Preheat the oven to 200 ºC. Cut a 4-cm vertical slit in the side of each pepper. Push a whole clove of peeled garlic through the slit of each red pepper. Push a large sprig of fresh basil into each green pepper, and a sprig of fresh rosemary into each of the yellow peppers. Put the green peppers into a big, deep roasting pan, place in the oven and bake for 20 minutes. (These need to bake for longer than the red and yellow peppers). 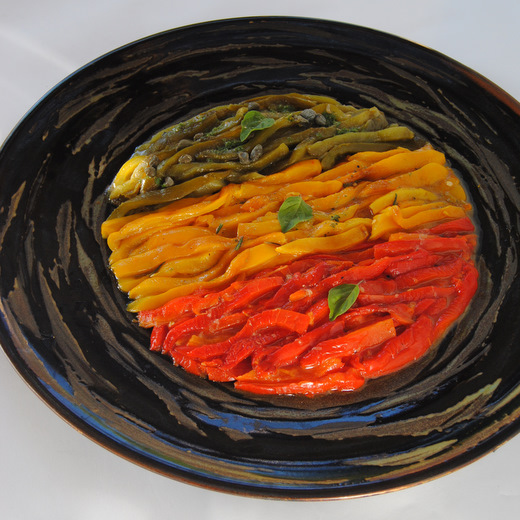 Remove the pan from the oven and arrange the red and yellow peppers, stalk-side up, in the pan. Bake for 45-60 minutes, or until the peppers have just collapsed, and are lightly browned and blistered. Turn the peppers now and then to help them cook evenly. Remove the pan from the oven and cover with tin foil, clingwrap or a lid. Set aside and allow the peppers to cool to room temperature. Uncover the pan and, using your fingers, remove the stalks, cores and seeds of the peppers, allowing the juices that have pooled inside the peppers to run back into the roasting pan. Discard the rosemary and basil sprigs, but retrieve the four garlic cloves that were inside the red peppers, and set aside. Place the flesh of the peppers, in three separate piles, in a large colander set over the sink, and drain for a few minutes. Slice the pieces of pepper into little ribbons (or leave them in big leaves, if you like), and arrange them in stripes on a big salad platter: green at the top, yellow in the middle, and red on the bottom. Now make the dressing. Strain the juices left in the pan, and measure out 4 tablespoons (60 ml) of this liquid. Place in a clean bowl and whisk in the vinegar and olive oil. Mash the four baked garlic cloves you set aside earlier, and stir them into the dressing. Season with salt and pepper. Now divide this basic vinaigrette into three small bowls (each bowl will contain 3 tablespoons of dressing). To the first bowl, add the crushed fresh garlic clove. Pulverise the fresh rosemary spring using a mortar and pestle (or a rolling pin), and stir this paste into the second bowl. Do the same with the fresh basil leaves, and stir the paste into the third dressing. Add a few drops of fresh lemon juice to each of the three dressings, and check the seasoning. Drizzle the garlic dressing over the red peppers, the rosemary dressing over the yellow peppers, and the basil dressing over the green peppers. I met my husband when he lived in a single bedroom flat, never to marry. Bob Marley featured on a poster as you walk into the kitchen....needless to say for my Afrikaner Dad, it was too much to stomach so Bob had to go.....we do have fond memories and tell the story often and realize how a marriage is all about giving and taking....Love the roast pepper salad.. I love this salad - such a great use for peppers. I have a few in my fridge. 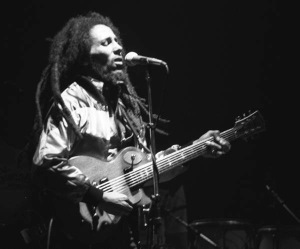 As for Bob Marley, he was a great musician and poet - A man ahead of his generation. Oh I love that plate!! And I love the salad :) Bob Marley will remind me forever of a school friend of my brother's whose mother was fanatcally religious and thought that M's devotion to Bob Marley (which clearly only deepened when he went to Rhodes!) was a sign of his total moral degeneration. :o) Parents - gotta love 'em! How wonderful that 79 (my birth year), is your special year with your husband. Bob Marley featured greatly during those awkward, Varsity studying and clubbing days of mine- a voice of reason and a testament to the man's universal appeal all through the decades. We still reach for the Marley on long road trips-"won't you help to sing/these songs of freedom". Need to roast me some peppers now! Oh how I love roasted peppers! Great backstory too. PS: Your uncle is very talented! I admired that beautiful white bowl of his in your potatoes with silken tuna sauce post as well.